This is a 1½-storey, front-gabled brick Homestead house with an interesting brick and terracotta ornament in the apex of the gable. All the windows have shallow segmental arches. A flat-topped, hipped roof spans the width of the house at the front. It has decorative shingles and a dentilated frieze. Below and to the right is a wide angled one-storey bay. To the left is a porch with two turned square posts and square turned balusters. There is a rear gabled addition with a long wooden side porch. 1893-99: Bricklayer John Albert “Jack” Terry (b. Portsmouth, ENG, c.1850-1910) and Annie/Anne (née Harris, b. London, ENG, c.1842-1895) were living in Toronto when their daughter Jessie Elizabeth (1874-1973) was born, and were in Victoria by late 1889. In 1891-92 Annie ran a boarding house in their home at 170 Johnson St: one lodger was a bricklayer and three were carpenters. 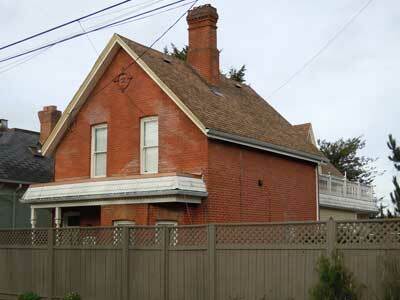 In May 1892 Annie and Jessie were able to afford to travel to England to visit Annie’s old home. In 1895 Jessie, a dressmaker at H. Young & Co, dry goods, 67 Government St, married bricklayer Thomas Donovan (1459 Vining St, Fernwood). Annie died three months later. In 1904, in Vancouver, Jack married the widow Annie Sarah Curtiss. They lost their baby Annie in early 1906, and some time between then and late 1907 they returned to Victoria. They moved into 1605 Store St, across from the train station, and Annie set up shop as a grocer, confectioner and tobacconist. Jack’s funeral was attended by his brothers from the Bricklayers and Masons Union. Annie sold her business after his death. 1897-1933: Capt Henry Parsons (1867-1918) and Caroline (née Stephenson, 1868-1933) bought the house in 1900, but were tenants from c.1897. Like their neighbours, the Coles, Noels and Pikes (1347 Pembroke St), they came from Harbor Grace, Nfld. Capt. Parsons was a well-known Master Mariner who skippered vessels in the sealing trade out of Victoria. He commanded the Wanderer in January 1896 when it was wrecked by violent winter storms off Cape Scott, the NW point of Vancouver Island. For two weeks the fate of the crew was unknown as they first drifted about without sail, then were washed up on a deserted shore after the ship was battered to pieces. After sealing was banned, Capt. Parsons commanded the Trader and then the tug Petrel for the Federal Department of Public Works. In 1916 he was hired by Findlay, Durham & Brodie at River’s Inlet; they were agents for various insurance and mortgage companies, as well as the BC Canning Co and Royal Mail Steam Packet Co. Capt. Parsons was a member of the Knights of Pythias. The Parsons’ son Ernest “Graham” was a seaman when he attested for service in WWI in January 1918. Pte. Parsons, a member of the Canadian Infantry, 1st Reserve Battalion, in the transport service, died at 23 in the 9th Canadian General Hospital at Kinmel Park, Wales, on October 26, 1918. He was buried in the Canadian War Graves section of the Bodelwyddan Cemetery, Flintshire, Wales. 1933-84: Another son Frank Parsons (1893-1966) married Gertrude Alys “Constance” Barrett (b. ENG, c.1903) in 1930. Frank had lived with his mother in the house after his father’s death until his marriage. After his mother’s death he and Constance moved into the house. Frank was a carpenter and shipwright in the local boat building industry until retiring in 1958. Constance lived here until 1984.